Finally, after thirty-five years, the Guatemalan military is being held responsible for murdering forty Mayan peasants. 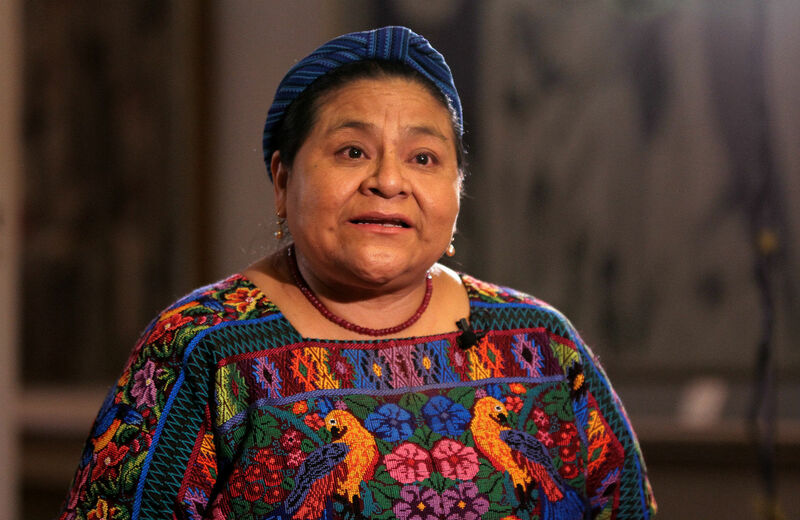 This week, a Guatemalan court vindicated Rigoberta Menchú. Menchú, as many will remember, was a poor, Mayan peasant woman who lost nearly her whole family to US-backed Guatemalan security forces, only to find herself conscripted into the US culture wars by pundits and academics, who, having picked apart her best-selling memoir, I, Rigoberta Menchú, charged her with exaggerating her hardships. Among the family members family Menchú lost was her father, Vicente Menchú, who died on January 31, 1980, in the Spanish Embassy in Guatemala City, after he and scores of other Mayan peasants occupied the building to bring attention to escalating repression in the countryside. In response, Guatemala’s National Police fire-bombed the embassy, killing nearly forty people, including protesters and embassy staff. One survivor, Gregorio Yuja Xona, was dragged from his hospital bed, tortured, his corpse tossed out on the street. convicted Pedro Garcia Arredondo, former head of “Command 6,” a special investigations unit of the now-defunct National Police, of homicide and crimes against humanity for his leadership of the 1980 siege of the Spanish embassy, which killed dozens of indigenous and student activists and diplomats. This notorious event during the Guatemalan internal armed conflict ruptured Guatemala’s relationship with Spain for years and preceded an intensifying conflict and further atrocities committed against indigenous communities and human rights activists. Thirty-five years after the events, this is the first time the case was heard before a court. The court also found Arredondo guilty of the attempted murder of protester Gregorio Yuja Xona and former Spanish ambassador Maximo Cajal, the only survivors of the fire. (Xona was later tortured and executed.) The three-judge panel further found Arredondo guilty of the murder of two students during a mass funeral organized to honor the victims of the siege. It’s an important verdict, and not only because it is a rare conviction in a country still largely ruled by impunity. The 1980 firebombing was one of the events Menchú’s fact-checkers used to discredit her account of Guatemala’s long civil war, which over the course of more than three decades claimed 200,000 victims. Menchú’s accuser, an anthropologist, argued that the embassy protesters killed themselves in an act of “revolutionary suicide that included murdering hostages and fellow protesters” in order to make the government look bad. It was a ludicrous charge, largely based on showing a few grainy photographs of the bomb scene to arson analysts. But it did its damage: it raised doubts about what many considered the signal event in Guatemala’s bloody civil war, a brute display of unyielding power when many Guatemalans, after realizing that no reform would be tolerated, threw in with a fast-growing insurgency. Blaming this massacre on the protesters was meant to undercut accounts that focused on “structural violence,” racism and economic exploitation for the ensuing genocide, when the army slaughtered around 100,000 people, mostly Mayan peasants, over the course of about two years (1981–83). Calling the killing a suicide also had the effect of transforming Menchú’s father from victim to victimizer, from someone invested with the moral stature of Martin Luther King into a crazed suicidal jihadi. From independence in 1821, an event led by the country’s elite, an authoritarian state was created that excluded the majority of Guatemalans; it was racist in theory and practice and served to protect the interests of a small, privileged elite…. State violence has been fundamentally aimed against the excluded, the poor, and the Maya, as well as those who struggled in favor of a just and more equitable society…. Thus a vicious circle was created in which social injustice led to protest and subsequently to political instability, to which there were always only two responses: repression or military coups.